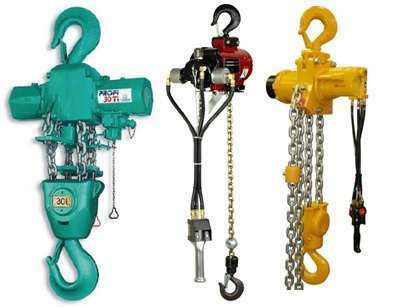 Jacks Winches offers effective chain hoist rental solutions for all your lifting and lowering needs. Our range of heavy-duty chain hoists of various chain lengths provides you with options to meet any industrial project requirements. Our chain hosts are available in compact air powered and manual configurations effective for lifting and lowering in confined spaces. We use only quality JDN and Ingersoll Rand air chain hoists and controls are available in pilot air pendant with E-stop if required. Various chain lengths are available which can be configured to suit your application with chain buckets if required. All Jacks Winches chain hoists are dispatched in purpose designed containers to protect the equipment in transit and to facilitate a safe and easy setup. Our range of rental chain hoists for hire exceeds 190 assets from 0.5T tonne to 30 tonne capacity. Zone rated hoists are available for certain sizes. Jacks Winches offers an extensive supply of chain hoists, block and tackle and chain blocks for either short or long-term hire. Contact us today for your chain hoist solutions.